What Does It Take To Be The Best SEO Company And Who Should You Choose? 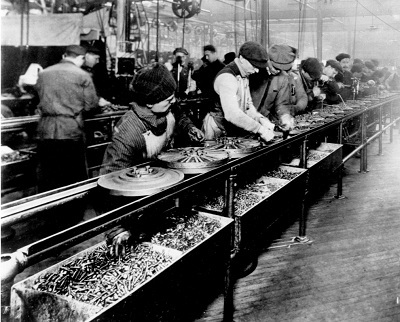 When I say the words “Assembly Line” what do you typically think of? Henry Ford? An Asian factory? Cooking dinner for extended family during Christmas? You probably were not thinking about your website’s ability to convert website visitors into leads or your internal sales team turning those leads into revenue. Don’t worry, that’s normal. However, that is exactly what Netmark thinks of when we talk about the Conversion Rate Optimization Assembly Line. Think about it for a minute. Your website and internal sales team are a long conveyor belt that is responsible for bring “suspects” into the sales funnel, converting them into “prospects” or leads, and finally turning them in clients and revenue. Most successful business owners realize that this revenue generating assembly line must work efficiently in order to insure high profit margins and a strong ROI on payroll and marketing dollars invested. I’d like to share with you ten “quality control” checks that you can use to make sure your revenue generating assembly line is running efficiently. Who are your customers? What are their real reasons for buying from you? Knowing exactly who your customers are and the core value propositions that are most important to them is critical. Additionally knowing what search terms, or keywords, they use when looking for a company like yours is equally critical. You must know your target audience. You must know what and how they are searching to be successful at improving your conversion rate. When your ideal customer searches Google for services like yours does your company appear in the list? If it does how does it appear? What does your ad copy or meta description say? Are your value propositions and main reasons to buy present? Does your messaging support your brand and make it easy for your ideal customer to know exactly what you do? Now is a good time to double check. Quality Control Check #3: Bounce or Engage? So your ideal customer clicked on your ad or link and came to your site. Congratulations! Do they stay and engage or do they get frustrated and bored and decide to click the back button (bounce)? Is the content on your home page or landing page highly relevant for what they are searching for? Are you proactively addressing their concerns, fears and worries with reasons why you are a trustworthy and credible business? What are your value propositions? Hiding or easily seen? Do you give them clear action steps and encourage them down the conversion path? Now is a good time to double check. They did it! They liked what they saw well enough that they filled out your “Request a Quote” form or picked up the phone and called. Nice work! Does your contact form qualify them in any way? Is the process to contact you or request information from simple (meaning a one step process)? Is your Google Analytics set up with the right rules and goals to track when a conversion happens? Are you measuring the right things that mean the most to you? Now is a good time to double check. Does your front desk/customer service person answer the phone when your ideal customer calls you? Or does voice mail do most of the work? How quickly are the leads assigned to a sales person to follow up with? Is your ideal customer being contacted within the hour while their needs are fresh on their mind? Do you track the changing status of your leads? Do you use a CRM for reporting, record keeping and note taking? It is regularly updated? Now is a good time to double check. Are your internal sales people involved in regular, consistent sales training? Do they role play, practice, and continually try to improve their skills? When they sell do they sound like a sales person or like a trusted advisor or consultant? Do they identify the real pains, problems and issues that are causing the ideal customer to be interested in your services? Do they uncover what the ideal customer’s budget is before they offer a solution? Do they discover who the decision makers are and what the decision making process is before presenting a solution? Now is a good time to double check. When your sale people present solutions to your ideal customer are they showcasing the right features and benefits that solve the pains and problems the customer is experiencing? Or do they spend hours talking about the history of the company and providing information that the customer does not find relevant to their needs? When was the last time you sat in on a sales presentation? Would you buy from that sales person? Now is a good time to double check. Congratulations! They decided to buy from you. Revenue is on its way! Is your sign up or buying process efficient and easy? Or do you require 4 forms of ID and a note from their doctor? Have you made the shift to electronic or automated processes? Do your sales people track their sales? How long is the sales cycle (from lead to close)? Is the CRM being updated consistently? Now is a good time to double check. Ever had buyer’s remorse? Ever had an ideal customer cancel their order a few days after buying? Do your sales people know how to “back out proof” their sales? Cool concept, huh? What about referrals? Are your sales people in a consistent habit of asking new clients, who are excited about their new solution, for introductions to their associates? Now is a good time to double check. Paperwork is signed. Check is in the mail. Time to deliver the goods. How does your sales team “hand off” the clients order to the fulfillment department? Is the order triple checked to make sure it is exactly what the ideal customer needs and what the sales person promised? Do your customers ever complain about poor communication, unmet expectations, lack of results, etc? How do you measure your customer’s level of satisfaction? When was the last time you measured? Does your company have specific expectations for managing and retaining your customers? Now is a good time to double check. Your company’s website and internal sales team is an assembly line that gathers curious “suspects”, converts them into interested “prospects” or leads, and finally turns them into satisfied customers and revenue. Some businesses have websites will very low conversion rates. And some companies have sales teams with very low closing rates. Both are serious problems that prevent companies from achieving huge profit margins and strong returns on their investments. By performing some simple “Quality Control Checks” along the conversion rate optimization assembly line, smart business owners can help take their business to the next level.